Where better to begin our look at the "New School" than with Coby Whitmore? Whitmore began his career in Chicago at Haddon Sundblom's studio so his roots are actually in the Old School. But he came to New York during the early 40's and joined Jon Whitcomb at the famous Cooper Studio - where the two men's work would come to epitomize the New School look. 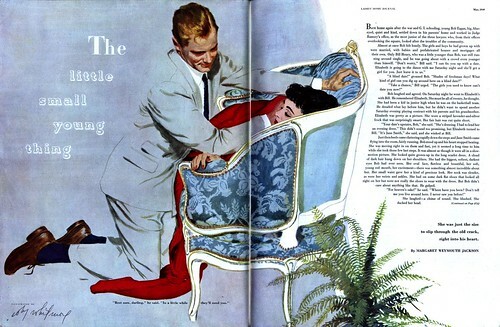 During the late 40's and well into the late 50's, hardly an issue of Ladies Home Journal and Good Housekeeping, the two highest profile and most widely read women's magazines, went by without story and/or advertising art by Whitmore and Whitcomb. These mi-40's examples(above) still contain a sense of painterly treatment and a clearly defined, "natural" picture plane. But Whitmore's technique begins to hint at what is soon to come. He is not rendering as much "finish" -- the medium seems to no longer be oil, but perhaps watercolour or gouache. There is a sort of drybrush quality and a lack of blending that gives the work a nice vitality. Then, in this 1949 illustration (above), we can see how the artist had begun to explore what would become typical visual cues of the New School style: background environment has been minimized or eliminated,leaving only a minimal amount of supporting props to hint at the location of the scene, the camera angle is deliberately obtuse and the figures are arranged in a visually unusual manner. Limbs, bodies and faces are partially obscured. Painting the entirety of the figure is discarded in favour of letting background and foreground blend together in an interesting arrangement of graphic shapes. By the early 50's, Whitmore is showing us why the new School artists were sometimes referred to as "big head" artists: here he has stripped the romance illustration down to the bare essentials needed to express emotion and interaction... heads and hands and absolutely nothing else. Then, during the mid-50's, what I consider to be the most visually interesting period of the New School style is displayed here with great skill by Whitmore: there are still the occassional fully or partially painted elements, usually the face and hands, and the rest is handled very graphically, with interesting patterning used to define clothing, and human and supporting environmental "props", like the flowering tree in this piece, intertwined into complex graphic shapes. 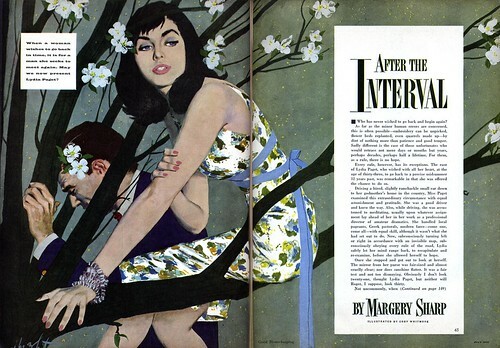 The 1960 piece below is the latest one I have by Coby Whitmore. 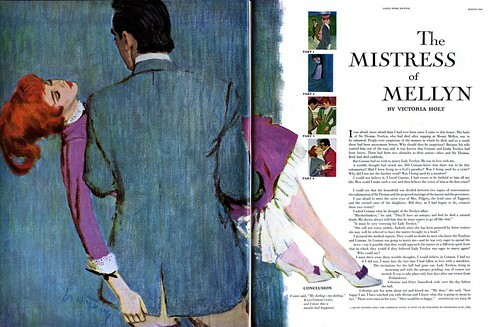 As photography and decorative illustration styles began to dominate the magazine market, "realistic" illustrators like Whitmore evolved the New School style into a rough, sketchy phase in an effort to remain fresh. It didn't always work. In general, clients asked for less and less of this sort of work and studios like Cooper struggled to remain open. I'm not sure what markets Coby Whitmore moved into after 1960, but with the drastic drop in magazine assignments many illustrators sought out work in the burgeoning paperback book cover business, others moved out west to participate in the lucrative "western art" gallery scene and no doubt many went into teaching. 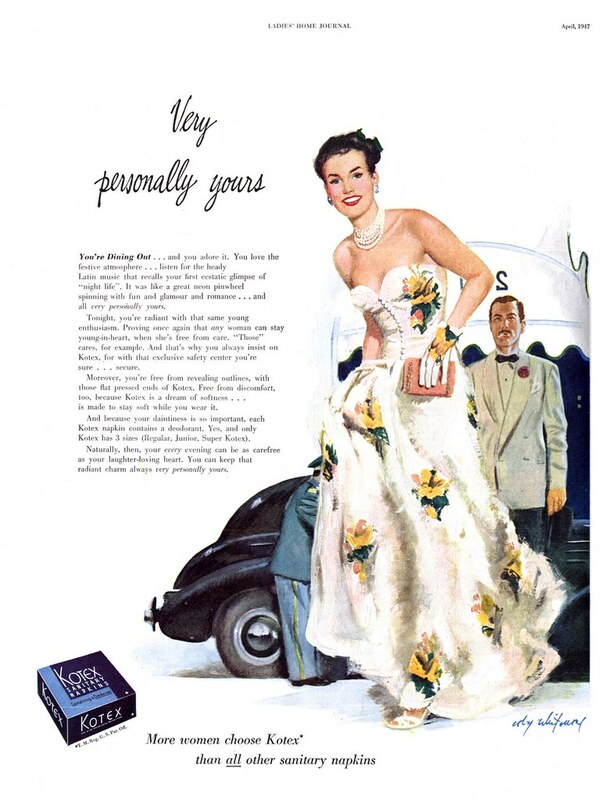 Of course there was still some work in magazines, but the glorious days of the 1950's, when the New School dominated the printed page, were over. We've looked at the other titans of the Cooper studio, Jon Whitcomb, Joe DeMers, and Joe Bowler in the recent past, so the rest of this week I'll show you work by lesser known - though still worthy - "New Schoolers". All of today's images have been added to my Coby Whitmore Flickr set. Another great analysis, Leif... From what I know of Whitmore, when he moved to Hilton Head, SC, in '68, he switched from the designer's colors he'd been using at the Cooper Studio to oils. He exhibited at a gallery there called, I believe, the Red Door. 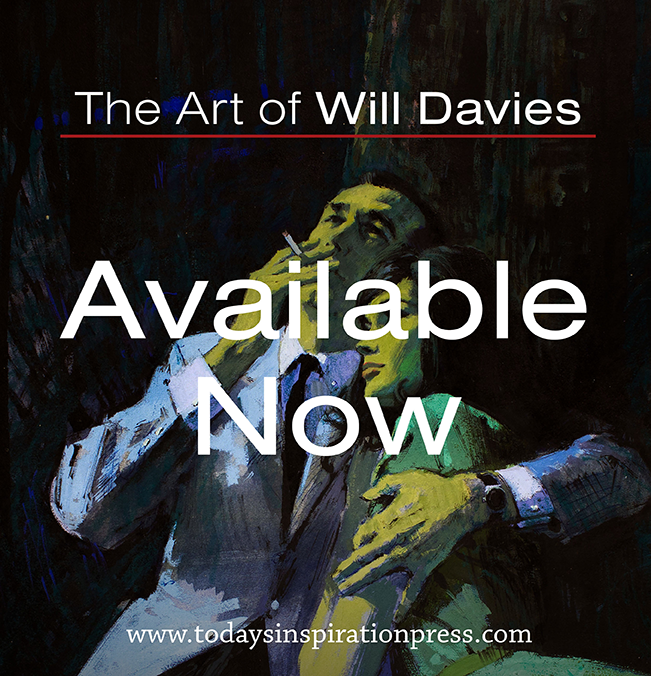 The examples of his paintings from this time that I've seen are figurative; the subjects usually being women in billowing dresses on hilsides, etc: lovely work to be sure, but not as interesting (to me, anyway) as his editorial illustrations, especially from the 50's & 60's. Love Whitmore . Enjoyed today's post. I enjoyed your analysis of Whitmore's work very much. Thank you. What an amazing change in style in ten years. I didn't know him until 1951, when his beautifully designed illustrations were his norm. In addition to his dramatic staging and cropping, Coby's almost impressionistic color also made him stand out. His woman were beautiful, his man were handsome, and the colors in their flesh and hair were luscious. I learned a lot by studying the colors of flesh on the turning edges of arms. One side would be not only darker but warmer and the other cooler. He once told me that he often made the tones on the lower part of a face slighter yellow and those on the forehead slightly lavender. It works, too. I also learned by studying the colors he used in hair.. they sing. 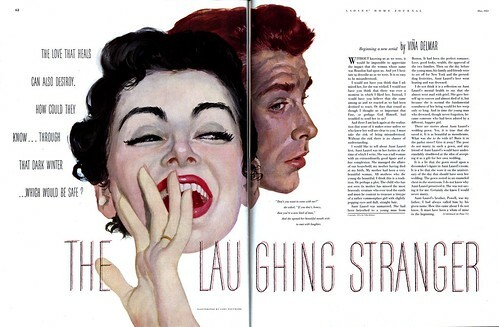 Have you seen his Saturday Evening Post non-pretty girl work. He painted believable gangsters as well as he painted beautiful women. Shortly after I left Coopers, he went to Switzerland to paint. thought I no longer could study the originals, I followed his work after and saw a big change. He started using oils instead of designers gouache. Some of his work of the 60s became looser and looser and almost abstract. I would love to see some of the paintings he did in Hilton Head. Joe Bowler is the one who knows them. I show my students Coby's work at least once a semester. His illustrations can teach them so much about: staging; design through dramatic changes of eye level, shapes, and simple effective use of props: and beautiful color. they inspires today's generations and still inspires me. Thank you for the insights on Coby Whitmore. Thanks for the great piece on my father. In answer to Warren's question, yes, Coby did live in Lime Rock Ct. in the mid 60's. He was an avid automobile fan and amateur racer. Together with John Fitch, one of this countries all-time best drivers, he designed a couple of sports cars which are still around today. In the late 60's he moved to Hilton Head Island and began a new career as a portrait artist. He painted the winner of the Heritage golf tournament each year in exchange for a studio overlooking Harbortown. These paintings can be seen in the Harbortown Grill. As Niel mentioned, he also did a series of paintings of "Low Country" girls which were patterned after Monet. Most of these were commissioned portraits, but a couple were reproduced in limited edition prints. If anyone has any other questions, I'd be happy to respond. Thanks for filling in some more details about your dad, Hilton Head Buzz! Coby Whitmore has long been a favourite around here and I'd love to learn more about him. Please contact me at leifpeng@gmail.com if you'd like to tell his story in greater detail, and I'll be very happy to post it here on the blog. Kelly, I'd be more than happy to provide whatever help I can. you can reach me at buzzwhit@gmail.com or buzzwhitmore@yahoo.com. Fantastic and thanks so much. There's so many times when younger generations of artists call upon the past masters and actually don't realize or fully know who these greats were. Your information is so valuable and insightful.